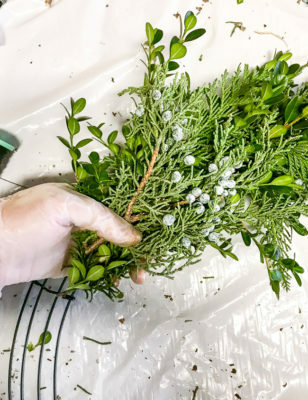 Mix fresh boxwood, cedar, and juniper for a cheery DIY Christmas Wreath to hang on your front door this holiday season! Tutorial below! 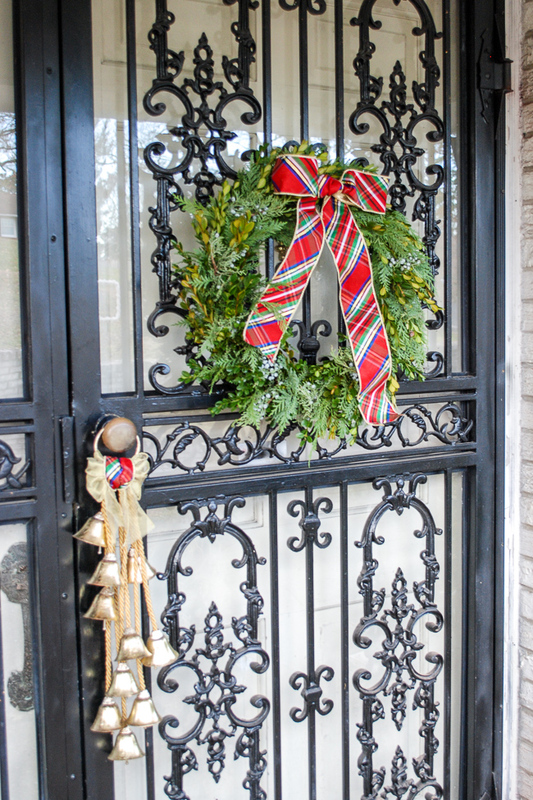 Walking up the front steps to a house with a fresh greenery wreath is one of the magical parts of Christmas. There is the intoxicating scent of evergreen… the vibrant color…the cheery bow. It creates such a warm Christmas greeting! 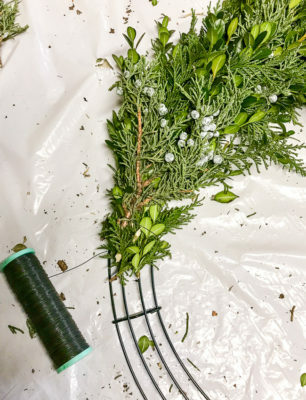 Make this magic part of your curb appeal by creating your own DIY Christmas wreath using fresh greenery. With just a few low cost materials you can make your own wreath in a couple of steps. Let me show you how! Step 1: Cut greenery in 5 – 6 inch sections. Be mindful of where you cut so that the ends look pretty. Try to cut at the fork of the branches. Step 2: Secure floral wire to wreath frame at top of circle. Wrap wire around one ring and twist ends until tight. Step 3: Gather fan shaped hand of greenery mixing cedar, boxwood, and juniper stems. Step 4: Place hand of greenery down on wreath frame. Step 5: Wrap floral wire around base of stems and frame 5 or 6 times to secure. Create a new hand and repeat, overlapping top of next hand on stems of last. Move all the way around the ring going in one direction. Two years ago I made fresh holly wreaths and filmed the process. 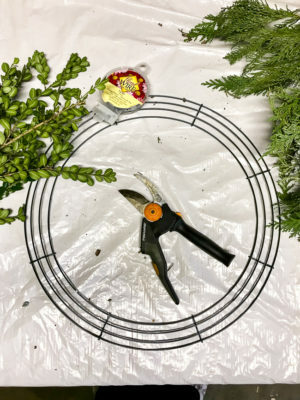 The wire wrapping method and wreath frame are the same for the holly wreath and the fresh greenery. 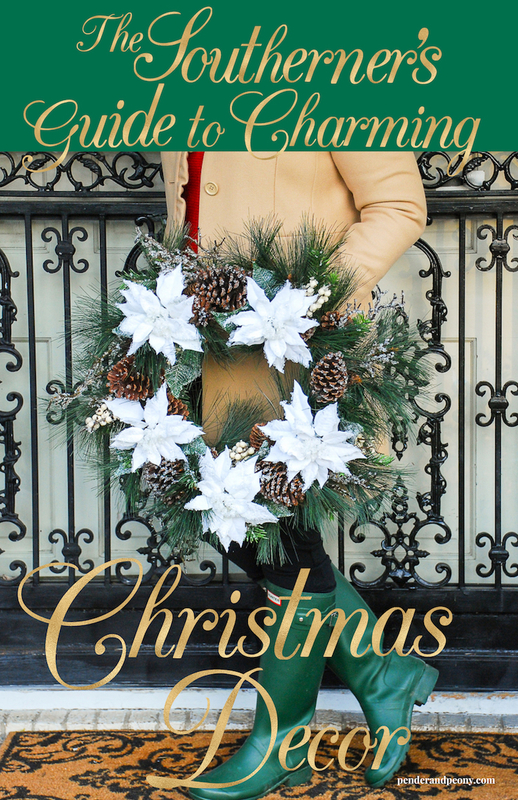 Check out this video for more details on making your own DIY Christmas Wreath! Layer first boxwood sprigs then cedar and finally juniper. 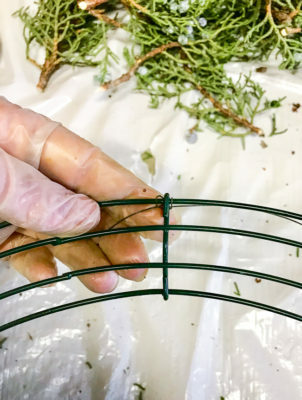 Hold the sprigs between your fingers and thumb, spreading them out at the upper end to create a fan shape. As you layer your greenery fill in gaps to make each hand full. Once you have filled in the entire wreath frame with your greenery, wrap the stems and leave the spool to the back of the wreath. Flip the wreath over. Cut the wire off leaving a 3 to 4 inch tail. Wrap this last bit of wire around the top ring and your finger to create a loop. Twist the end around the base of the loop to close. 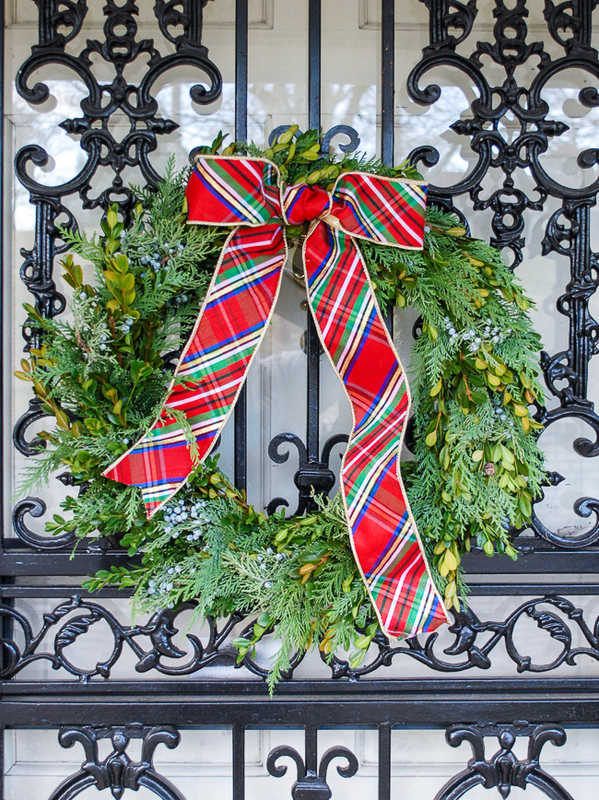 Tie a pretty bow on your fresh greenery wreath and hang it up on your front door to enjoy! Need help tying a bow? Want more Christmas decorating help? 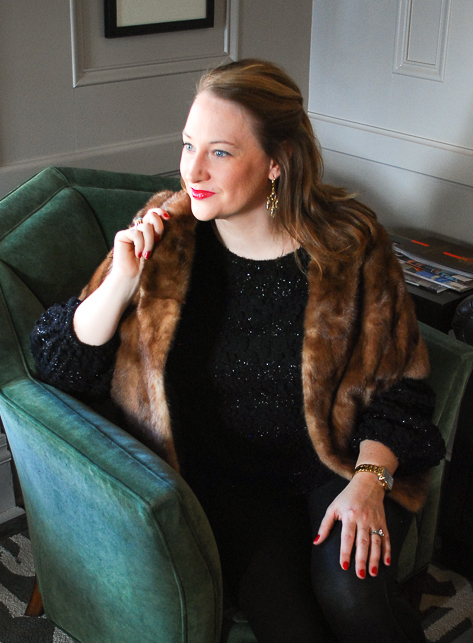 Sign up now for the Southerner’s Guide to Charming Christmas Decor! What an awesome post!! I am totally saving this for later. I love how it turned out. The mix of greens is so beautiful! Oh! I’m so glad you found it useful.If you try to make one and have questions, don’t hesitate to let me know! Merry Christmas! This is such a great wreath! i love the different types of greenery you used! Thank you Ruth! Me too. 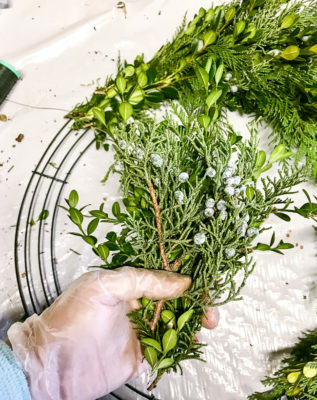 I love to mix juniper in to a holiday wreath it smells so good and the berries add a unique touch! The ribbon you chose is so pretty! I just pinned this so I can try it out next year. 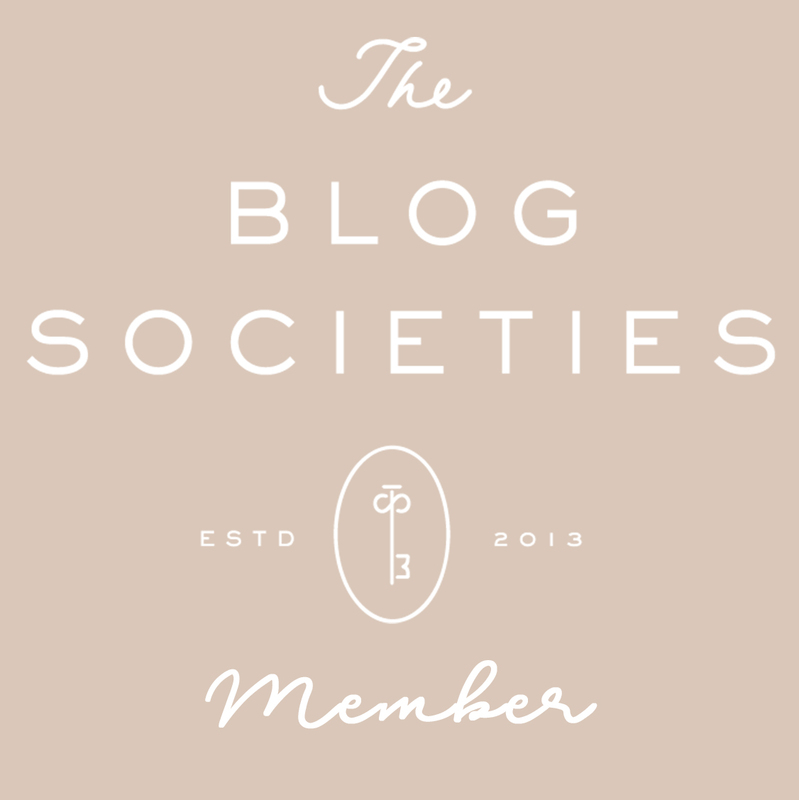 I am obsessed with this ribbon! It is the perfect plaid, and it ties really beautifully. Merry Christmas and thanks for stopping by! Thank you Kathryn! I really appreciate it, and I am glad you like the wreath.